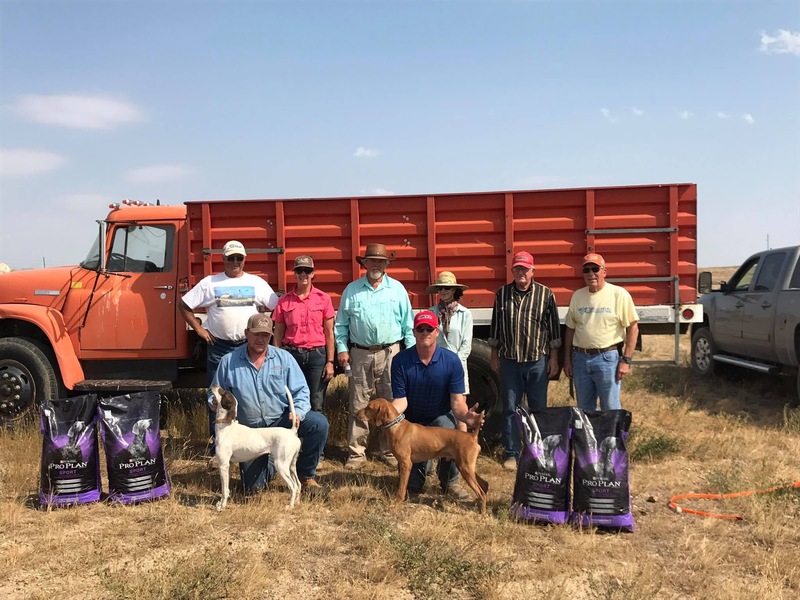 The Big Sky Field Trial Club announces that the Winnett field trial will begin Wednesday, 9th of May, 2018. 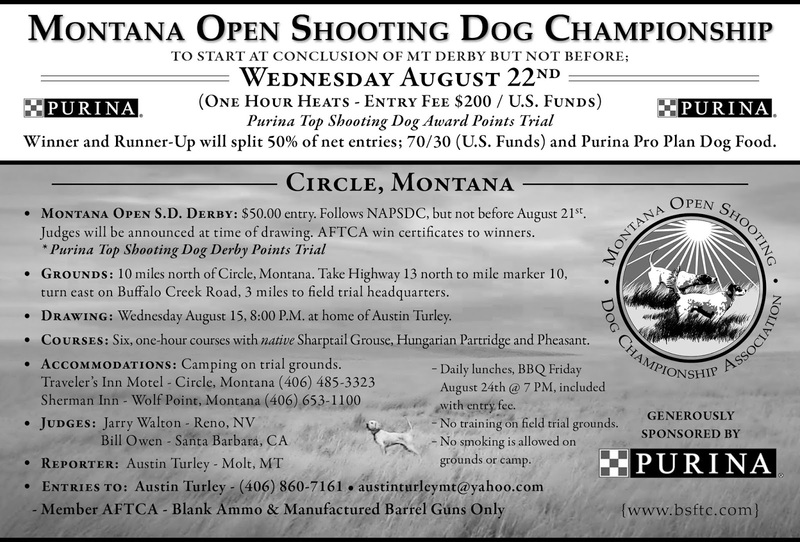 The trail will start with the Open Shooting Dog followed by the accompanying derby stakes. 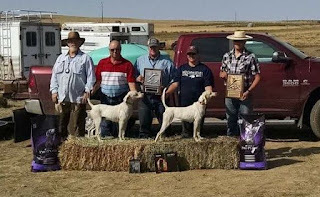 The Region 14 Amateur Shooting Dog Championship will follow all of them. The sentiment was to allow the Open stakes to run first so the pros could run their dogs and depart allowing the amateurs to have the end, which will potentially be a weekend. 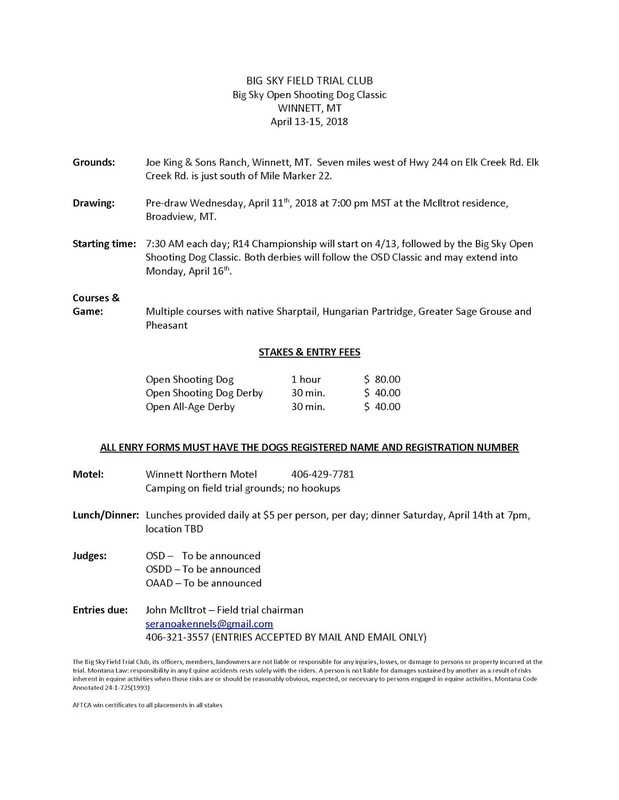 The landowners of the Winnett grounds have informed us that due to significant snowmelt, and the forecast for continuing precipitation through next weekend, the weather does not make it conducive to host the trial as scheduled. Consequently, it is postponed. There is a possibility that the trial might be rescheduled for the second weekend of May. 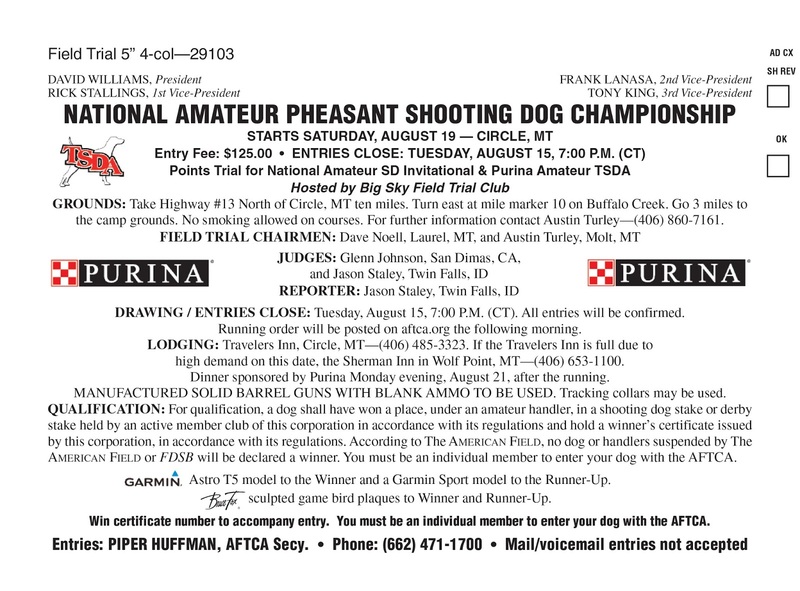 The Big Sky Field Trial Club will host it's annual meeting at 11 am on Saturday, December 17th at Famous Dave's BBQ. 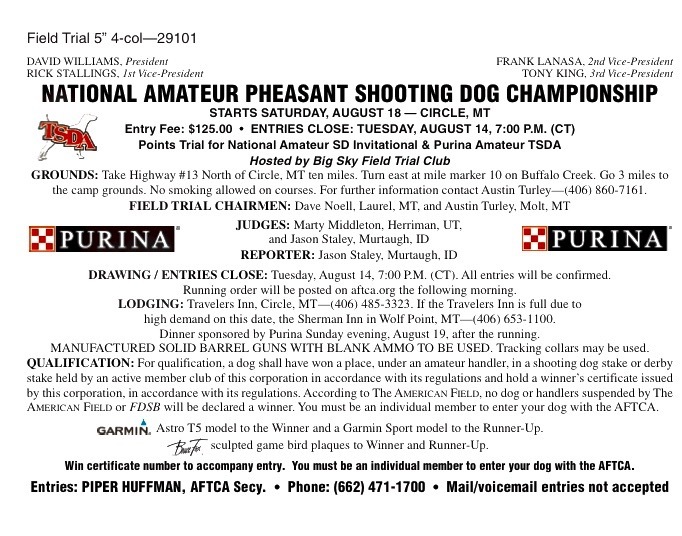 Located at 1230 North 7th Avenue in Bozeman. The BSFTC has a separate room reserved for the meeting. The restaurant will be immediately on the left, in the old KMart parking lot. 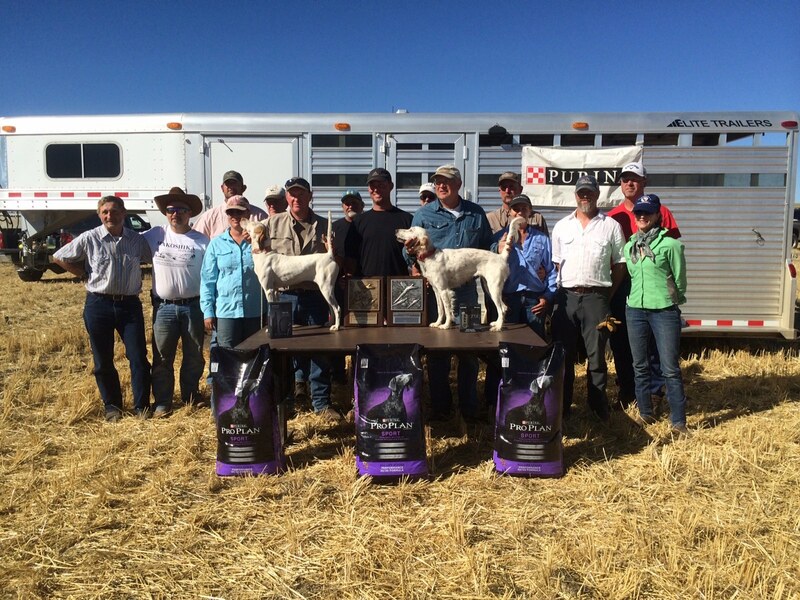 The Big Sky Field Trial Club will host it's annual meeting at 11am on Saturday, December 12th at Famous Dave's BBQ. Located at 1230 North 7th Avenue in Bozeman. The BSFTC has a separate room reserved for the meeting. From left: front row - Michelle Turley, Austin Turley w/Touch’s Catrina, Mike Robbins, Dave Noell w/Gin N Tonic Livewire, Michelle IcIltrot, Brad McCardle, Shannon Grady-Nygard. Back row - Joe Schaefer, Chris Potter, Jason Lafrance, Nard Bailey, Joe Rentz, Pat Lockhart, John McIltrot (judge), Todd Mann (judge). 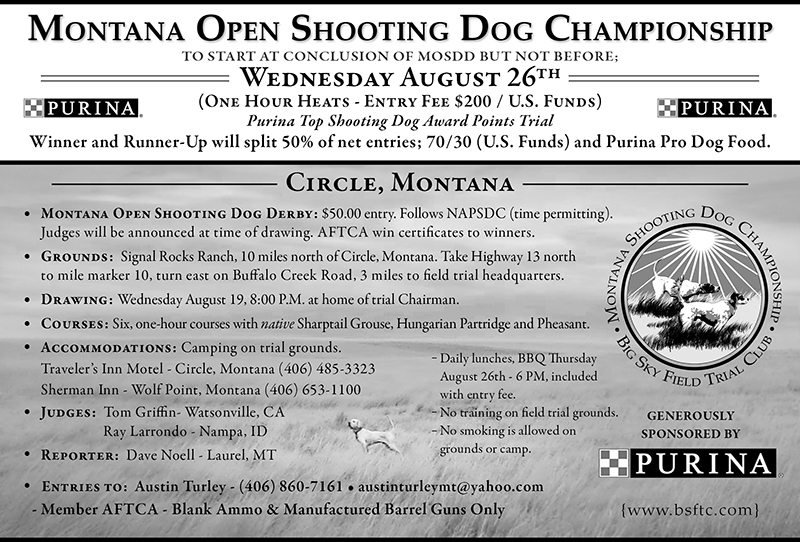 The announcement for the Montana Open Shooting Dog Championship appeared in the issue of July 18, page 2, the trial starting on August 26. 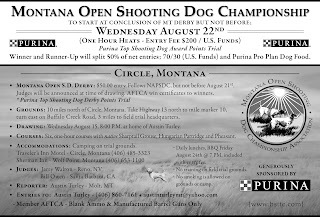 After the ad was submitted it was learned that the Purina Awards Committee had approved the Open Derby as a points stake for the Shooting Dog Derby Award. 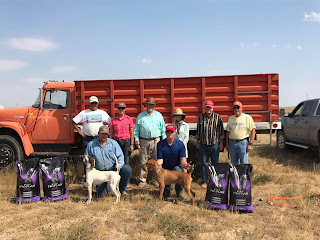 Welcome to the Big Sky Field Trial Club! 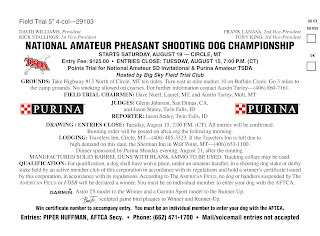 The Big Sky Field Trial Club is a member of the Amateur Field Trial Clubs of America (AFTCA) and Region 14 of the AFTCA. 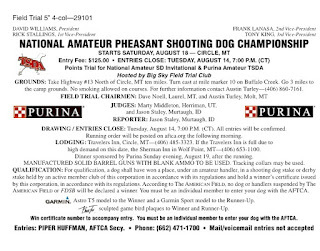 The Club currently hosts the National Amateur Pheasant Shooting Dog Championship and the Montana Open Shooting Dog Championship. 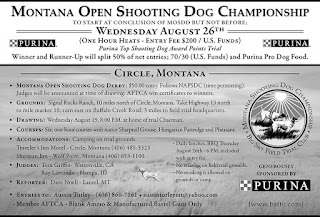 In 2016 we were granted the Big Sky Open Shooting Dog Championship. 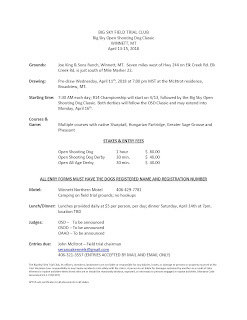 We also host the Montana Open All Age Classic. 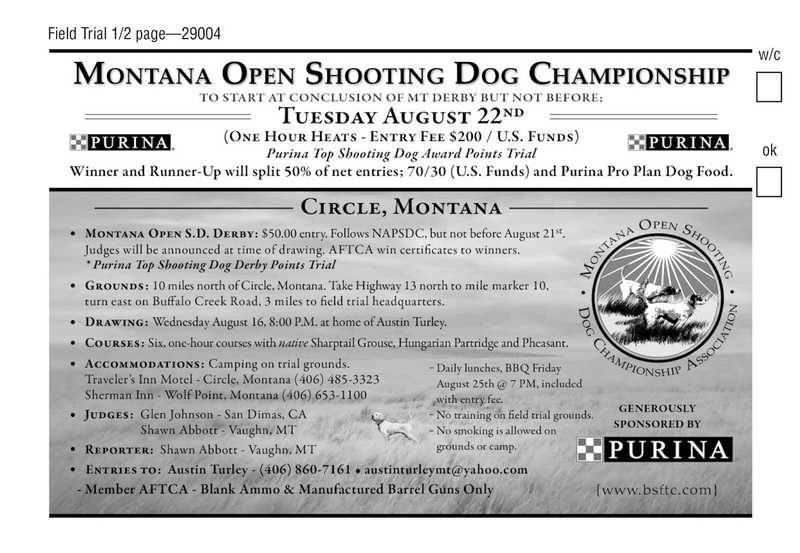 You may download a copy of the 2013 AFTCA By-Laws & Running Rules here. EDMONTON, ALBERTA: Spring Trials - cancelled. 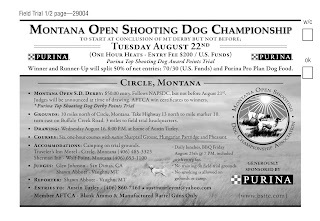 Every year the Big Sky Field Trial Club members vie for the title of Dog of the Year. 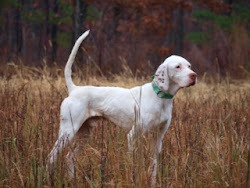 Below are photos of the most recent Dog of the year and a history of the previous winners.